9 - New and lighter systems, including quadruple digital fly-by-wire flight-control system. 10- New man-machine interface with fully-glass cockpit with two large LCD screens and helmet mounted display. The OKB Sukhoi design bureau and the KnAAPO factory are now focusing their attention on a project with the internal designation T-10BM ( Big Modernisation ) and the official designation Su-35 , The one and the only presentation so far of this new edition of the Su-35 was a model that was put on display in December 2003 in Dubai. The Designation Su-35 has a long history , In 1992 , Sukhoi assigned the designation Su-35 to the export version of the Su-27M ( T-10M) fighter fitted with canards and the N011 radar. Series production of the Su-27M started in Komsomolsk during the last days of the Soviet Union. Five of the 15 manufactured fighters ( including the prototypes ) are presently in service with the 237th Regiment at Kubinka Air Base near Moscow ; several others are used as experimental aircraft. The Su-35 was offered without sucess to several countries including South Korea,UAE and Malaysia and is presently taking part in competition in Brazil. It should be noted that this Su-35 is a new project and not a Su-27M. The demand for Su-27/Su-30 fighters as they are manufactured currently bu KnAAPO has been nearly fulfilled and it is still a long way to Russias new-generation fighter the PAK-FA. On 26 April 2002 , a government committe chose Sukhoi's T-50 offer in the contest for the 5th gen fighter PAK-FA fighter , On 10 December 2004 Sukhoi submitted the T-50 pilot project for approval by the airforce. Statements made then say that the prototype T-50 will fly near the end of 2007 and its series production will commence in Komsomolsk around 2012-15. The Su-35 ( T-10BM) should fill the interim period. Therefore 2007 has been declared by the Sukhoi design bureau as the year when the work on the Su-35 is to be completed , Another objective of the Su-35 programme is to gradually test and implement solutions under development for the T-50. The "transitional" fighter Su-35 is being realised by the same co-operating parties that take part in the T-50 programme. The absence of subsystems and components imported from beyond Russia in the Su-35 project is regarded as being a great advantage for the Russian Air Force as well as for some foreign customers , such as China. 2 ) The fins are smaller than before and the sting protruding rearwards between the engines is shorter. 3 ) The high-lift devices have been changed and are similar to those applied to the Su-33 shipborne fighter with big flaperons occupying the whole trailing edge of the wing. 4 ) The Su-35 will be powered by two of the new AL-41 F1A turbofans , providing 142 to 147 kN of thrust each.The AL-41F1A engine is as "transitional" as the whole Su-35 aircraft. The final production engine for the PAK-FA (T-50 ) will be the AL-41 F1 fitted - when compared with the present A version - with a new core. In July 2003, all the leading Russian air engine manufacturers signed an aggrement to work together on this. The Tikhomirov NIIP institute in Zhukovsky is now designing for the Su-35 the new N035 Irbis radar with passive electronic scanning . When compared to BARS the Irbis radars antenna is suspended on a quick-fastened console rotating in azimuth by 50 to 60*(degree) to each side ( therefore securing a field of regard of more than 200* ) ; the console is additionally rotated in roll. The Su-35 has also a small radar installed inside the sting between the engines and looking aft. Such an idea has been developing in Russia since mid-1980: rear-looking radars were installed on several prototypes of the 'old' Su-27M/Su-35 ( N012 radar designed by NIIR Rassvet) , to the Mig-1.42 ( Rassvet N015) and to the Su-27IB ( V005 radar by Leninets ) . At the same time , tests were made of the air to air missiles launched rearwards. The interest in this concept declined and only came back in early 2000s. The Tikhomirov NIIP institute suggests for this purpose its passive phased array radar Osa and is expected to announce a new active phased-array radar of this class within the next few months. The model of the Su-35 (BM) shown in Dubai in December 2003 carried an interesting armament . A large supersonic anti-ship missile of the Onyx/Yakhont/Brahmos family ( depending on the customers requirement , each of the missiles variants may be used ) was carried between the engines. Under the wings were two ultra-long range KS-172S-1 air to air missiles developed by the Novator Company of Yekaterinburg. 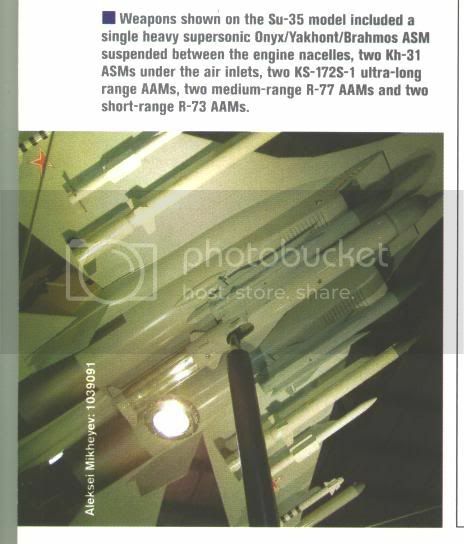 This was the first presentation of this missile after 10 years of silence ( in August 1993 , in Zhukovsky a full-size mockup of the KS-172 missile was shown with the Su-30 fighter ). The maximum range of the KS-172, stated by Novator is 300 km. The missile is to be used against targets flying at any altitude betwenn 10 - 100000 ft with speeds of up to 4000 km/h and with g-loads up to 12 , including all types of aircraft , as well as long and medium range anti-aircraft missile ( in self defense ). The remaining weapons seen on the Su-35 model were standard Kh-31 air to surface missiles and R-77 and R-73 air to air missiles. Last edited by Austin; 26th December 2005, 12:58. The Su-27BM "should" countinue the Su-27SM program from 2007 for VVS Rus, while being called Su-35BM for export. Lets see if this gets an export order..
With the Irbis/Osa combination this is going to have a hell of a sensor package. It will be interesting to see if multiple variants are produces, ie two seat examples, and if the improvesments of the Su-35BM are transferred to the Su-34? Su-35BM are transferred to the Su-34? I dont know about avionics , But after 2010 the Su-34 is slated to get the AL-41F1 engine , The AL-31FM is a stop gap arrangement , The AL-41F1 will give the Su-34 a supercruise capability. Last edited by Austin; 26th December 2005, 13:49. To be honest I think the Su-35BM would be a good match for the Eurocanards (which show no sighns of getting AESA soon) and it should be able to upgrade to AESA once it becomes available in Russia anyway. I was under the impression that the Su-35BM designation referred to new build variants (ie-possibly for export) whilst the upgraded older model airframes were the Su-27BM? Arent the EF and Rafale slated to get the AMSAR antenna before 2010? 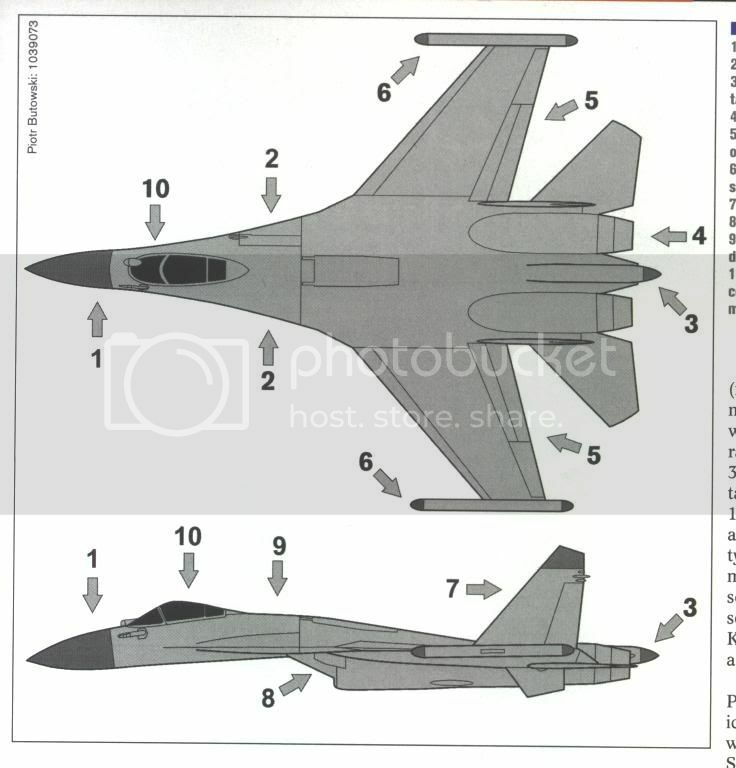 If you look at the Su-35 (T-10BM ) , also refered to as Su-35BM now and then , Its actually a redesigned aircraft and as the name suggest its a Big Modernisation , from Pit post " 25% save of take off weight due to all new composites material construction that allows increased fuel and weapons load" , Indeed a radical change and hence referred to as 4++ gen fighter by Russia. Enhanced use of composite materials and the new Al-41F1A engine should give the BM sustained supercruise capability and a High T/W ratio. If I am not wrong the EuroCanards and Rafale will get AESA from 2012 onwards , Russian AESA is not far behind , The Russian too should have AESA by 2012 . After all of the years of development, the AL-41 now needs a "new core?" Last edited by TinWing; 26th December 2005, 17:00. The New Core for the AL-41F1 will power the 5th gen PAK-FA , with a Thrust rating of 155+kN . All indications are that the PAK-FA is dead in the water. The program specification is being revised, and Indian interest in a smaller a/c plays a role in it. The Sukhoi T-50 project will end up being another experimental a/c akin to the S-37. What is referred here to as the T-10BM is indeed a very good design and has a chance to become the main RuAF fighter for decades to come, along with, perhaps, MiG-35. About the Typhoon, no idea. 2012 for the RAfale, unless a customer want it before that date. According to what he paid, it will be more or less quicker. All indications are that the PAK-FA is dead in the water. The program specification is being revised, and Indian interest in a smaller a/c plays a role in it. And who gave you that indications , The PAK-FA program is continuing , although the newer miltech 11/2005 says that the Russian are waiting for the JSF program to evolve to study it and partly because of fund crunch , No where does it mentions its dead infact its a priority program for RuAF. The Indian are opting or showing interest in Mig design because they are not interested in a heavy fighter , The Mig 5th Gen design is a medium weight 25 Ton MTOW and is a single engine fighter , where as PAK-FA is in the Su class twin engine heavy fighter . Mig design also allows greater customisation for Inida tailored according to India's needs the PAK-FA is more of F-22 class with Russian specification greatly influencing it. The PAK-FA design is still classified but unofficial picture even showed in latest miltech shows it to be very similar to the Raptor . i guess in time we shall see what comes out of it..Would be a tremendous acheivment if Ru is able to come up with 2 fifth gen. fighters..I for one would really like it to happen..
You are interested in defense-related matters, but unfortunately you grew up in a cave and do not like the plural KeyPub-community that questions every single one of your beliefs. Luckily, now there is an alternative at last. Anybody know why they decided to leave off the canard, do these have TVC, and are they newbuild or rebuilds? At least the claim about "25% save of take off weight due ...." is nonsense. Effective gains are ~10 % at best. Many new items still in the prototyp stage. So wait and see, which of the prospects given will be fullfilled in 2008? !